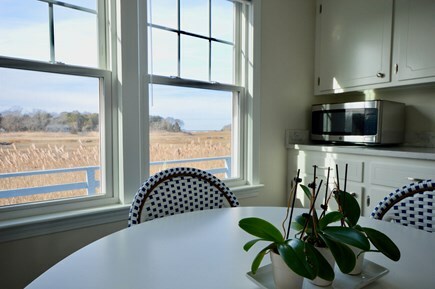 Situated at the end of a private road, Sun Glow overlooks Little Namskaket Marsh and Cape Cod Bay in the distance. Conveniently located between Skaket Beach (0.9 miles) and Rock Harbor (1.3 miles), and only 1.2 miles from Orleans center. Only 0.6 miles to the Cape Cod Rail Trail, a 27.5 mile-long asphalt trail for biking, running and walking. 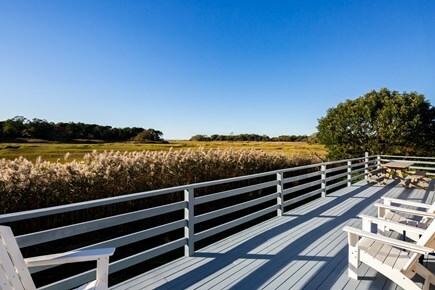 The starring feature of Sun Glow is its large deck overlooking the marsh. This is the perfect spot to enjoy the view of the bay or one of Cape Cod's spectacular sunsets, hence the house name. The marsh is home to an abundance of wildlife. Depending on the time of day, you might get a glimpse of a hawk in flight, a White Egret or a Great Blue Heron. There is plenty of outdoor seating and a propane grill so you can enjoy meals outside or just lounge with a book in one of the Adirondack chairs. The enclosed breezeway is another great spot for reading and relaxing, and kids will love the large, grassy yard. The location is private and very safe! Inside, the home is undergoing renovations which will be complete by the new year. More photos to come! You will enjoy full AC throughout with brand new mini split units throughout the house, as well as an updated kitchen with brand new floors and quartz countertops. There are three bedrooms and two full bathrooms, each with tub/shower. Downstairs there is a queen bedroom and upstairs there is a king bedroom and a kids room with bunk bed and two twins. The house sleeps 8 comfortably. With its modern amenities and unique location, Sun Glow is a very special place to get away from it all!